Physicists in Netherlands and Japan are the first to flip the value of a magnetic memory bit by firing a very short pulse of circularly-polarized laser light at it. Unlike other magneto-optic data storage systems, no external magnetic field was required to flip the bit, which meant that its value could be changed about 50 thousand times faster than the fastest conventional memory. 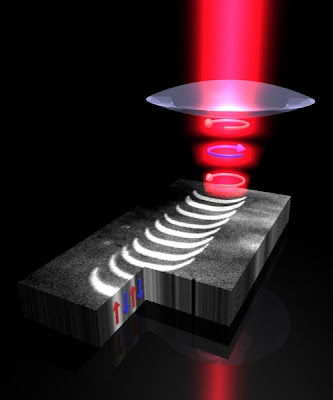 The result could lead to the development of low-cost and ultrafast all-optical magnetic hard disk drives. This entry was posted in data storage and tagged physics on August 9, 2007 by Jay.